Layering up some some dresses for winter office wear. Something I do frequently (I love extending the opportunities in the year I can wear pies in my wardrobe), but something that perhaps was a little poorly thought through this time, considering it was the coldest winter week we'd had for a while. The weekend before it had been the coldest day in 4 years, so very chilly temperatures. Being stubborn and having nothing else planned to wear though, I persisted with wearing my dresses! Could not resist going a bit monochrome here with the blue macintosh, blue sheath dress and blue Louis Vuitton shawl. Do I look cold though? I was freezing! I thought the scarf, ankle boots, and cardigan I wore under my coat would keep me warm, but I was shivering on the way to work. Such a chilly day. I ended up needing my coat when we went out for lunch too. I did regret not picking something warmer to wear. Cold weather aside, I did like this outfit. I loved all the blue together, and this Mulberry Bayswater bag holds everything I need for the office. While this sheath dress is definitely worn the most in the warmer weather, it's nice to do something different and layer it up a little for winter. Just maybe will pick a less chilly day next time I try! Last worn: navy macintosh, grey cardigan, Louis Vuitton shawl, Paisley print sheath dress, RMK ankle boots, Mulberry Bayswater. Other ways to wear: navy macintosh and pencil skirt, grey cardigan and maxi dress, Louis Vuitton shawl and floral dress, Paisley print sheath dress and heels, 30 ways to wear black ankle boots, Mulberry Bayswater. Perfect for pregnancy: Paisley print sheath dress in second trimester, RMK ankle boots in second trimester, Mulberry Bayswater in second trimester. Following exactly the same outfit formula as the one above, with a pretty printed sheath dress, the same ankle boots, cardigan, and Mulberry Bayswater bag. I did make a change and instead of wearing the blue macintosh I wore this cosy trench coat - it's warm and lined and I didn't feel the cold as much in this outfit. I was also able to leave my coat behind when I went out for lunch, it was a warmer day overall. I've always found this sheath dress tricky to wear outside of summer. Fleecy tights is my default winter wear with dresses and skirts, but black and orange? Makes me think of Halloween. I added the black belt to try tie in the black tights with the dress, and I did consider swapping out the grey cardigan for a black one. But my black cardigan is a lot thicker than this and I wasn't sure it would fit under the coat! I still quite liked this outfit, even with the grey cardigan. 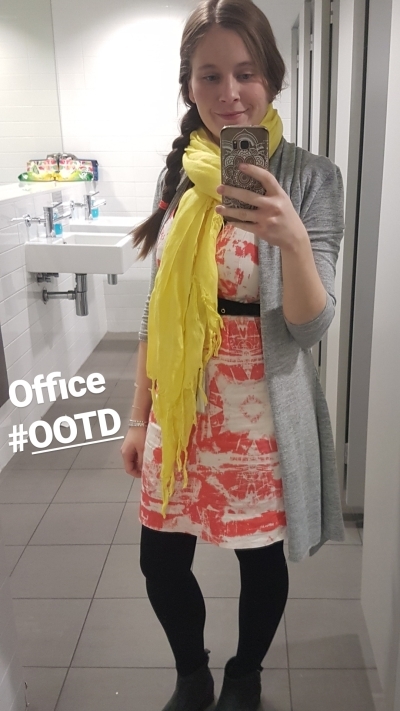 While the bold orange dress is enough of a statement on its own, I felt like adding more colour and wearing this yellow scarf. It's such a big scarf, perfect for wrapping around a few times and keeping me cosy. Thought it would be a good colour to wear with this dress after I loved my yellow statement necklace with the orange print when I wore it previously. I really liked this outfit! Last worn: camel trench, grey cardigan (above), yellow Love Quotes scarf, orange sheath dress, velvet belt, RMK ankle boots (above), Mulberry Bayswater (above). Other ways to wear: camel trench and burgundy pants, grey cardigan and jeans, yellow Love Quotes scarf and grey maxi dress, orange sheath dress and blazer, velvet belt over a blazer, ankle boots and shorts, Mulberry Bayswater and chambray dress. Perfect for pregnancy: camel trench coat in second trimester, yellow Love Quotes scarf in second trimester, orange sheath dress in second trimester, ankle boots in second trimester, Mulberry Bayswater in third trimester. Printed sheath dresses, or any summer workwear staple, can easily be layered up for cooler weather. A business casual office environment like mine makes ankle boots a practical and suitable choice. You can also add extra layers for your commute like a cardigan under a thicker coat, and a warm and cosy scarf. The cardigan comes in helpful when you reach your desk if your office aircon is too cold as well! 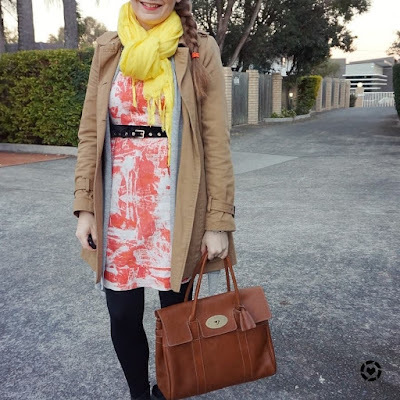 Linking up with Confident Twosday, Turning Heads, Trend Spin. Dear Mica, I like both of your looks, too! So sorry you were that cold with the first look on that cold day but what you combined looks absolutely fantastic. Love also the second look - how wonderful you combined the bright and bold colours togehter! Enjoy the new week! 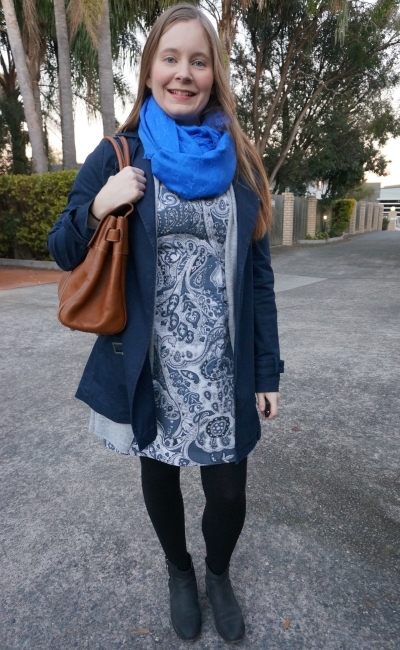 Love both of these dress and scarf combos! So chic and sophisticated for the office. Happy Monday pretty lady! I am that lady that will maximize her dresses on the coldest days as well..haha:) I absolutely adore both looks! Your accessories always pop and compliment beautifully! The second dress is super attractive and I love how you layered with more color to create a fabulous and fun on the go look! As always, thanks for the inspiration and I pray you will have a blessed new week! Thanks Tiff! It's definitely good to wear my dresses, even on colder days! Your layering is on point! 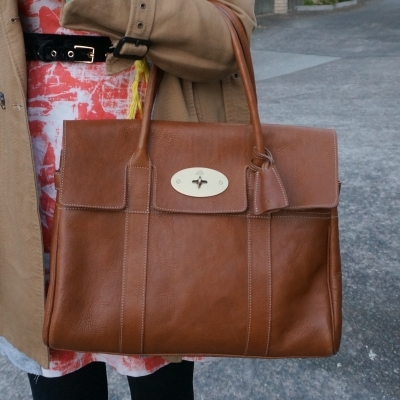 And I love love love your Mulberry Bayswater in Oak NVT leather! It's such a gorgeous bag and so classic! I think you are just brilliant for making these dresses so versatile, Mica. And the yellow scarf with the red is right up my alley---I love it. Even though I usually like the bright colors best, I still love the blue outfit---it's so pretty!! When it's super cold outside, I have been known to layer my tights and wear a pair of pantyhose under my tights. I'll even sneak a tight shirt under my dress for more warmth. Since I'm always cold, I have to do these extras!! Thanks Jodie! I've never layered tights together before, but that's a good tip! My tights are fleece lined which helps! Love that handbag! So cute! What fun, colorful looks! Your LV shawl is gorgeous! That shade of blue is beautiful and adds a such a fun touch to the first outfit. These are two very beautiful sheath dresses. I love how you layered them and of course I am crazy about your handbags. Have a wonderful week and I hope the weather is lovely. Weather extremes are never fun for outfit photos, but we preserver anyway! I love all the blues together. True! Problems of being a style blogger, haha! My favorite outfit is the first one. I love how the color all work well. I hope your family feels better soon. Have a great week. Thanks Amy! It's hard in winter when everyone gets so sick! You didn't look cold in you first picture at all, but the sun is always misleading. haha yes - Queensland life - sunny even when it's cold! What a great bag, so versatile! I really like how you've styled it too, very chic! 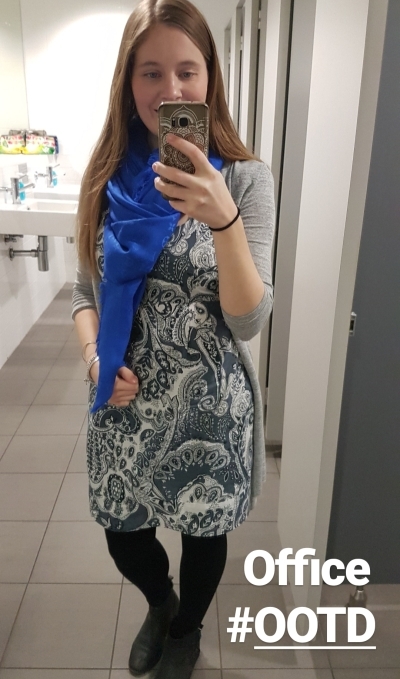 I also don't give up wearing dresses in the winter, despite the cold !! The solution is the layered look. In the street we look like a bear with so much clothes, but then in the office we look very elegant with a dress !! I like your second option most, I think it's more colorful !! I hope you have a great work week. I hope you have a wonderful week and you're feeling better! Love how you're embracing those fall vibes! Such cute outfits - thanks for sharing! I really like both of your outfits! You are so good in combining this dress with accessorize and presenting great outfit! Thanks for sharing! I wish you great week! Loving these layers! Makes me so excited for fall. I like how you layered a cardigan and a coat. I have to say that the addition to both looks of the bright scarves on your neck are perfect, those bright shades make your eyes and skin tone shine. Thanks Lorena! I love my bright scarves! Yes loving the printed dresses. i need to wear more dresses as it is so hot here. And as usual great accessories. I have a hard time finding ways to wear bright colors outside of summer too. Orange with black makes me think of Halloween too. And yellow and black always makes me think of a bumble bee. It just occurred to me to try and find some navy fleece tights and that might solve the issue for wearing both colors in the winter! Both are great, easy looks. More women should wear dresses when they are this easy and comfy. Well done, Mica! The things we do to look good right! But the monochrome look is beautiful! Your trenchcoat is very nice, I love a classic item! haha yes, I didn't want to try come up with a new outfit for the weather when I knew this would look great! That Mulberry bag is gorgeous, you can tell it's one of those versatile bags which will age beautifully. The second outfit is my favorite, I love the colors! Love your blue paisley dress the Mulberry bag, so classic and beautiful. Have a happy midweek dear! 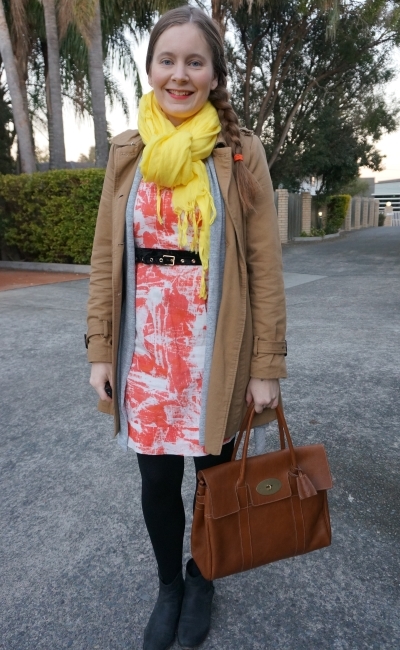 I love how you layered your printed dresses for perfect. Pairing them with a nice cardi and a coat is a great way to keep warm, but still look chic. You look fantastic. The Mulberry bag is so elegant! I'm totally with you- it can be tough to work in those brights come winter. I'm loving that Mulberry! You're giving me a lot of winter outfit inspiration! Shame the first outfit left you cold, but it looks so cute! 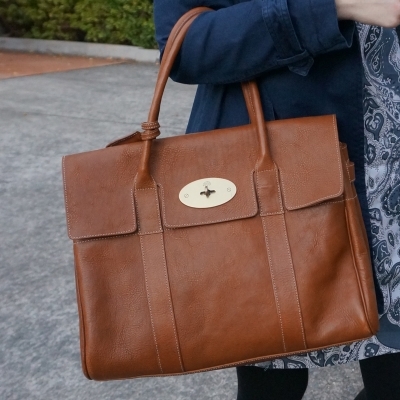 I LOVE Mulberry bags! I love that first outfit especially--all the blues are so pretty together! Sorry you were so cold though, I hate being cold all day. I tend to be the same way though and often wear what I planned regardless of the weather... stubborn! haha yes! Thankfully I wasn't cold in the office, just a very cold start to the day! Your layering are always on point lady. I love how classy sheath dresses are. You look great and office ready. I really like both outfits, that bag is such a chic and timeless piece and looks great with both looks. The second one doesn't look Halloween-y because you have the white in the dress breaking it up and the pop of yellow offsets it too, great styling! 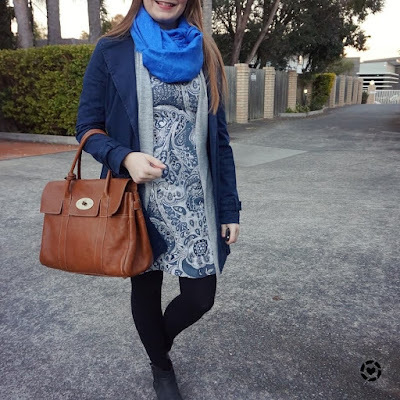 Love the blue outfit, and the paisley print dress! It's pretty similar in color and general look to one of mine. These are both lovely looks. The dresses are so pretty and I especially like the bright yellow scarf against the background of the second orange dress. Is this the Bayswater you mentioned you don't use too often? I love the colour though! I must admit my Bayswater hasn't had much love - it seems too corporate for my kid-centric life right now - I just can't part with it though... when I go back to work, maybe, haha! Yes, I'm having the same issue! It's perfect for corporate life, but I don't work as much as I did so it's not worn as much as it could be. Not an everyday kid friendly bag for me! Such a chic look dear! Loving the colors and the comfy layers.